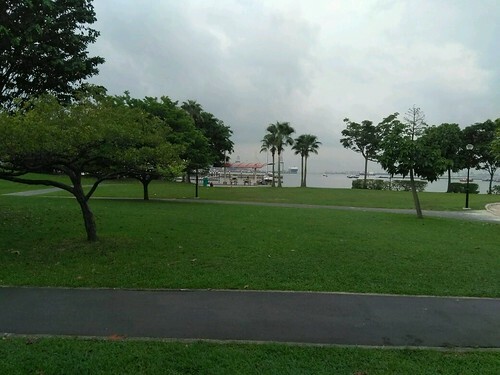 At that time there was just the one - East Coast Park parkrun, which started in June 2014. 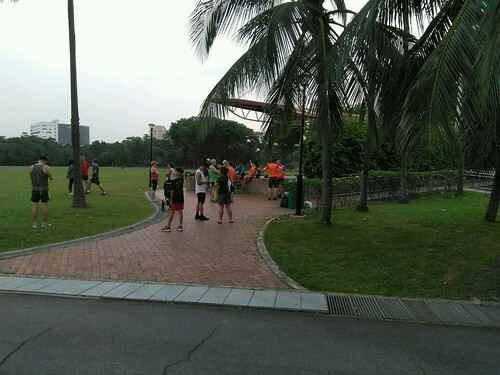 Now there are 3 - West Coast Park parkrun started in December 2016 and Bishan parkrun a year ago in April 2018. We booked to visit them in April 2019. 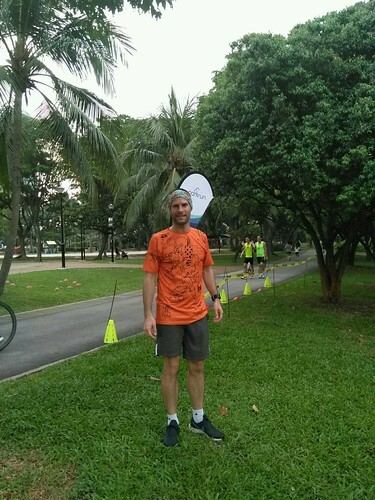 On Saturday 20th April 2019 I visited the closest parkrun to their apartment - West Coast Park. 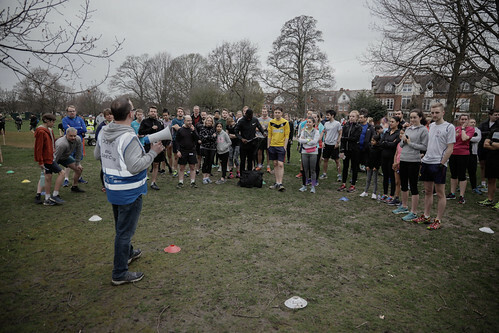 Just before 7.30 we had the first timers briefing, and the volunteers seemed surprised at how many first timers there were - 24 out of the 69 runners were first timers from all around the world. 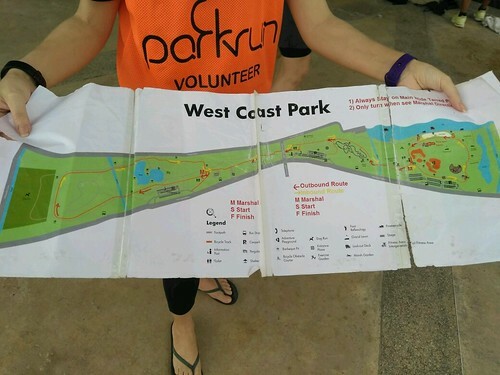 West Coast Park parkrun is best described as an elongated figure of 8. The start is in the north west of the park and runners head south east, under an underpass (very similar to the one at Burgess) and do a clockwise loop of the south east. Then you head back up towards the start but then take the right fork for an anti-clockwise loop of the north west section. The finish is about 100m further on from the start. At 7.39am, with 31 degrees C and quite possibly 100% humidity, we set off. After the first 200m I realised I could not keep up the pace I’m used to in the UK and had to slow down a lot. After 25 mins and about 5 litres of sweat I had completed a run in my 7th different parkrun country. This is a relatively flat parkrun and in the UK would be considered a PB course, but with the heat and humidity it was really tough. Only the top 3 managed sub 20 - Michael MCCARTNEY in 19:48, Johnny LOW in 19:52 and Aryaman NAGPAL in 19:55. I was almost 6 minutes slower than my previous parkrun time, but kudos to my wife Scarlett WATTS who was 2 minutes quicker than her previous time! 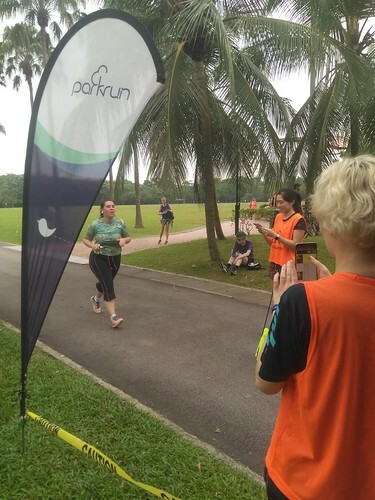 One thing I remember was overhearing a conversation which went something like this: There are 3 parkruns in Singapore. 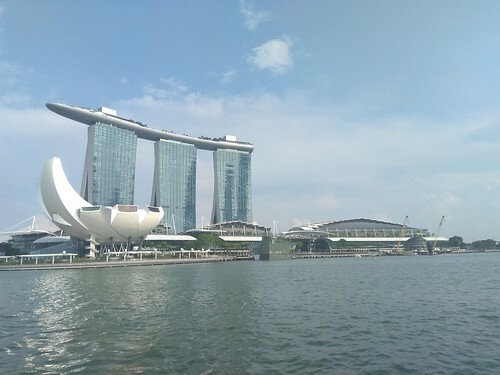 East Coast Park was the first, but West is best! But what happened at Tooting? This week 489 people ran, jogged and walked the course, of whom 74 were first timers and 33 were running their first ever parkrun. 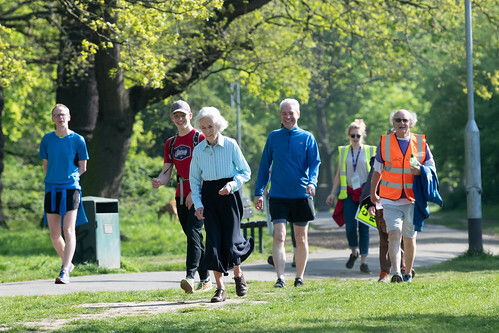 Among the first timers today were Bushy regular Jonathan DICKINSON and parkrun Ambassadors Douglas Archibald CAMERON and KC LLOYD, and Phoebe HILARY, completing her first ever parkrun at the age of 86, became Tooting Common parkrun's eldest female parkrunner. 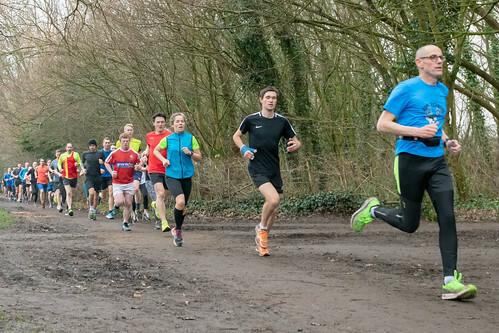 86 recorded new Personal Bests, and representatives of 32 different clubs took part. 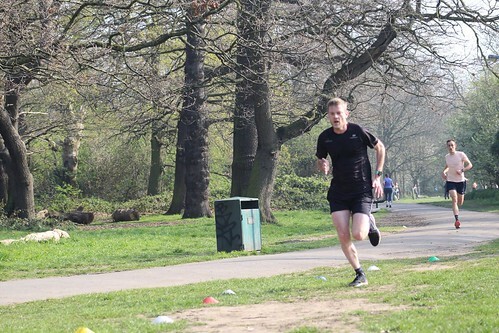 Gavin BRANDIE (VM40-44) of Clapham Chasers RC was first over the line in a new PB of 17:08. 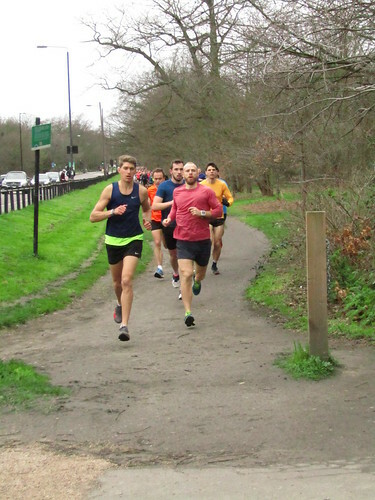 Mark TATLOW (SM30-34) of Clapham Chasers RC was second over the line in a new PB of 17:22. Olly BELLAMY (SM25-29) of London City Athletics Club was third over the line in a new PB of 17:33. Lucie CUSTANCE (VW35-39) of Clapham Chasers RC was first over the line in 17:52. Lois BOND (SW25-29) of Windsor, Slough, Eton & Harrow AC was second over the line in 19:20. Ruth Jean CHALMERS (SW30-34) of Herne Hill Harriers was third over the line in 20:15. Congratulations are due to Damian FLEMING, who completed his 100th parkrun today, and Helen OLDFIELD, who completed her 50th. - Our junior stars this week were Riley JEIN, Sasha BENN, Finley ALLEN, Nicholas MONTAGUE and Verity O'CALLAGHAN, who all achieved new bests today. - April MARRETTA LORD and Richard ROSENBERG made it a volunteering-PB double, helping set up and pack away while notching up new best times of 27:00 and 22:12 respectively. 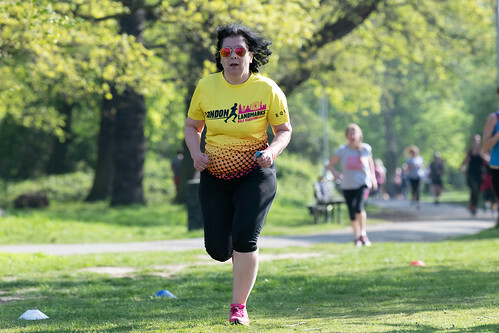 - Jolanta URBANEK returned to Tooting Common for the first time in 3 weeks and improved the time she set over 2 years ago by over a minute, crossing the line in 23:18. Nice work, Jola! Marathon season is upon us! Those lucky enough to get a place in London, Brighton or Paris (or maybe even Boston) are lacing up for a taper run, while the rest of us mere mortals are enjoying the first break of spring (and more than likely, a bout of hayfever). And so far, touch wood, we haven’t been washed out by a torrential downpour. With the participation numbers on the up, we trialled a new double funnel system today with great success, thanks to our 50 (!) amazing volunteers. 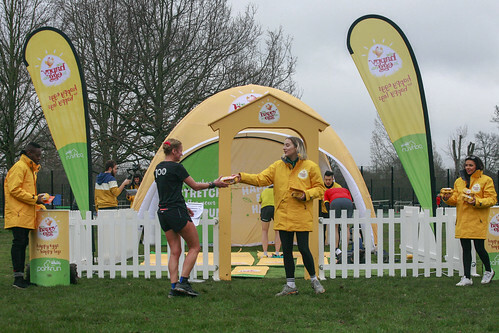 The first to enter the new funnel was Herne Hill Harrier Nick Bester, adding yet another first place to his impressive haul of 17 before today – talk about consistent! 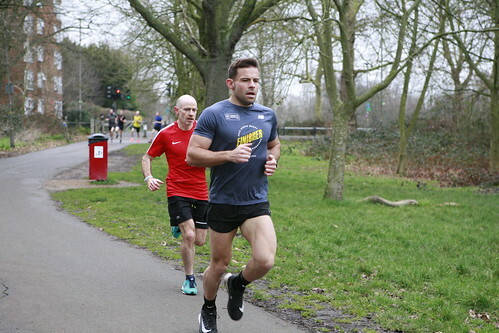 He was chased in by Kent AC’s Peter Lighting on his first run at Tooting, finishing 7 seconds behind Nick in 17:01, with Clapham Chasers’ Joe Elliott just 11 seconds behind Peter for third place. In fact it was a pretty tightly packed field at the front, with 18 runners under 19 minutes; Sam Noakes just missed out on this threshold by clocking in 19:00 dead, but will surely be thrilled with his time nonetheless as it nabbed him a PB! PBs also went to all of the first three lady finishers, including first lady Isis McLachlan, who took 9 seconds off her previous best time to finish in 20:29. Isis was clear ahead of Herne Hill Harriers’ Helen Oldfield in 21:03, and Taryn Retief from Boksburg AC was 43 seconds behind Helen. In fact, 160 runners registered a PB today, with 26.8% of female runners beating their previous best compared with 20.5% of male runners. And probably the most impressive PB mention of them all goes to Libby Mitchell of Royston Runners who took the highest age-grading score of the day (83.11%) while slicing 20 seconds off her time from three weeks ago! There was also a great show from the 21 under-18s, 5 of whom ran their first ever parkrun and a further 7 clocking in their best time on this course. Special mentions go to Curtis Hines as first junior male (54th position overall) and Georgina Waight as first junior female (211th position overall), and Curtis also ranked among the top 20 age-grading scores. 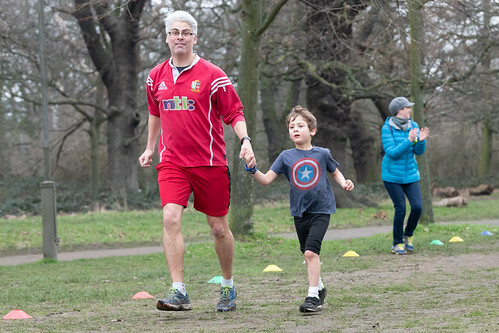 We’ll keep a look out for Graham Spiby next week – he ran his 99th parkrun on Saturday and leads the charge for the next milestone, along with second lady Helen Oldfield and Emma Davies who are both on 49. Meanwhile William Frame, Simone Ragavooloo and Roshan Ramlugun all completed run number 50 to become eligible for the much-coveted red shirt – congratulations everyone! And finally, my treat to myself – the stats… 40 minutes and 17 seconds separated the first and last finishers, so our mean time was 37:03 – Katherine Griffiths in position number 659 came closest to this. Meanwhile, David Patterson came in in median position 345 with a time of 26:42. Emma Graham finished exactly on our weekly average time of 27:15, and with 54% of the field finishing inside this time it looks promising that the average time will continue to drop. 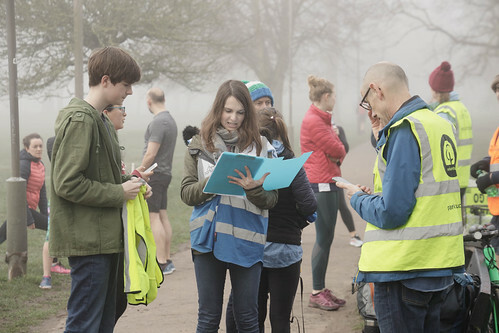 If you’re still here (I wouldn’t blame you if you weren’t) I’d like to sign off by thanking our brilliant volunteers, without whom Saturday mornings would look very different, and encourage all our runners to give up a run a year to help out. 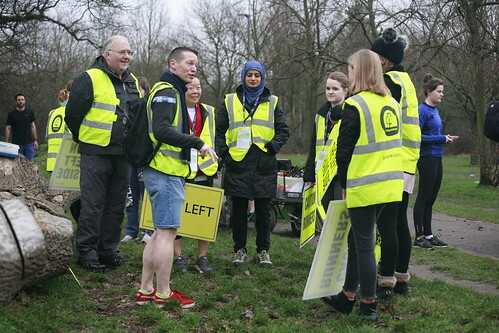 Please contact tootingcommon@parkrun.com if you’d like to get involved or speak to one of the marshals at the next event, and if you find volunteering really isn’t for you that’s fine – just remember to always thank your marshals! 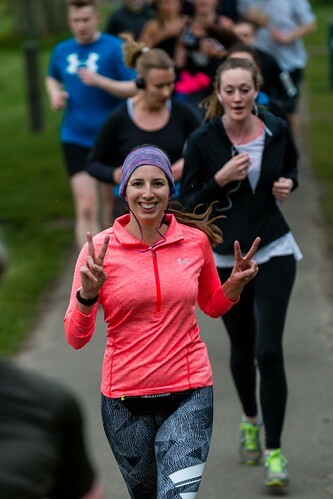 One of the amazing things about parkrun is the positive effect it has on mental and physical wellbeing, to the effect that parkrun is now in places prescribed by GPs to encourage active lifestyles, reducing the need for medication. But parkrun can’t do this alone, and other initiatives are encouraged. 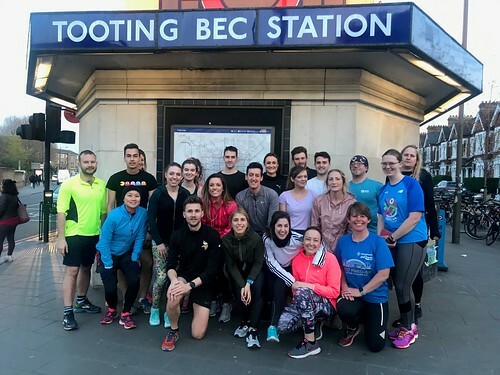 Run Talk Run have been meeting on Monday nights at the Wheatsheaf Pub in Tooting Bec since the start of January this year. We are a community that focusses on running 5km as a collective, and we don’t give a damn about pace. We have a group that ranges from people that have just finished couch to 5km to those that are running sub 3 hour marathons. It’s about getting together at the start of the week in a free, friendly group (...and sometimes we have a cheeky pint afterwards). We also create a safe space in which people can feel comfortable to talk about their mental health. This is a huge spectrum and doesn’t have to be super serious. It’s about being able to create that outlet if you need it, whether it's work issues, family life or the fact that sometimes London can be a very isolating place. It is also lending an ear and offering avenues of support if things are getting too tough. It's also cool if you just want to come and run - pre-hab is just as important as rehab! Running is incredibly cathartic, but so is doing it alongside great people. In the last few months we’ve grown to a group of 30. 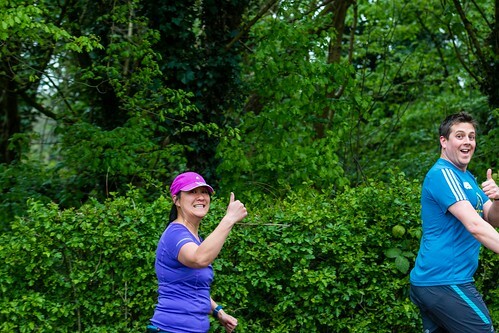 We geek out over our running goals, chat about everything from deep discussions to utter rubbish and use parkrun at the weekends as a great measure of our progress. 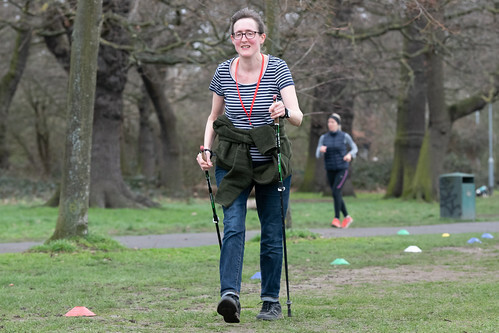 Run Talk Run was set up by Jessica Robson over a year ago and has successfully grown as a mental health community with groups not only all over London but also all over the UK, USA & Australia. So if you’re interested check out https://runtalkrun.com/ or @runtalkrun on Insta, and for specific Tooting RTR info e-mail me at joshpewter@gmail.com. Failing that, if you want to give it a go just turn up & join us next Monday 7:15pm at the Wheatsheaf! On to this week’s parkrun! It was another fantastic turn out this week at Tooting. 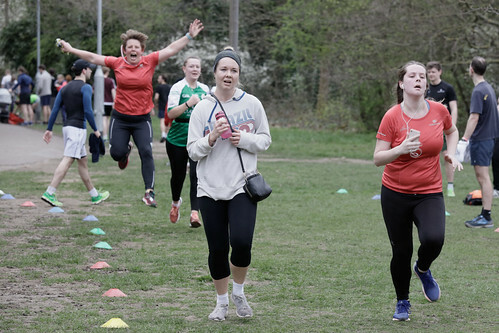 646 people ran, jogged and walked the course, of whom 92 were first timers and 44 were running their first ever parkrun. 134 recorded new Personal Bests and representatives of 34 different clubs took part. 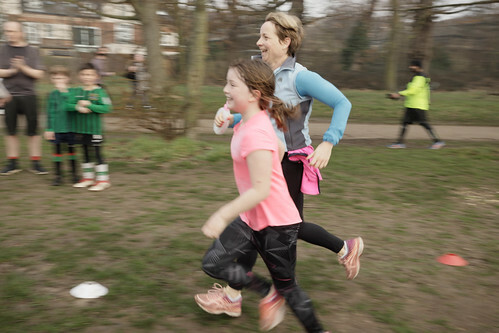 It's superb to see so many young parkrunners out in force, especially with the new Tooting Common junior parkrun just having started. Our junior stars of the week were Finn Maguire, Silas Gordon, Samuel Taylor, Curtis Hines, Jacob Dilley, Nicholas Taylor, Matthew Boyde, Peter Francis Kielty, Jake Bamford, Alex Chilton and Martha Brennan, who all recorded new bests today. Well done to you all! Some other fantastic runs including Anthea Gordon who, while accompanying her under 11 year old son Silas, managed to run a first ever sub 27 finish of 26:39. 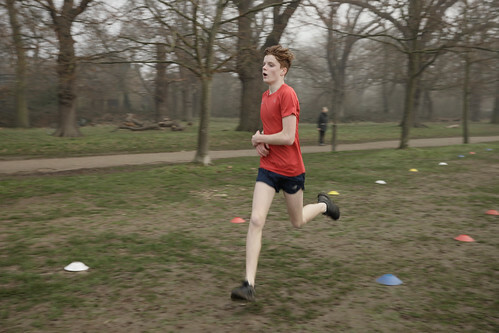 George Dunn continued his recent good form, knocking 17 seconds off the time he set a few weeks back to clock 21:30. Regular set-up volunteer Nicola Worton notched up her first PB since February with a fabulous run of 31:27. Great work Nicola! 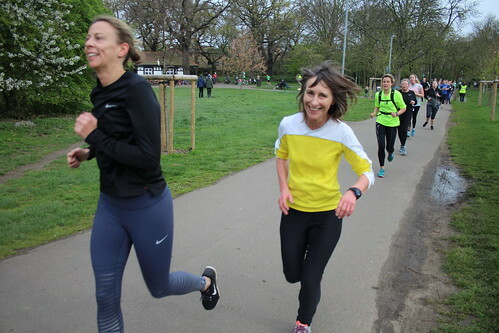 Lastly, a big shout out to my RTR group - Aida Alvarez Suarez achieved her first PB since starting running at Tooting parkrun in January, and ran a sub-30 parkrun for the first time by crossing the line in 29:47. Enhorabuena, Aida! 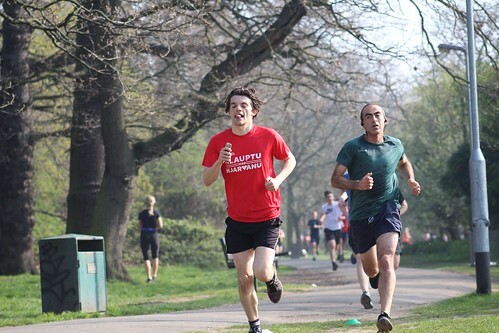 Also massive shout outs to Sam Clough (28:33) for his first parkrun, accompanied by Gen Farrell (28:41) from RTR as well. Milestone shout outs this week are due to Elena Grineva, who ran not only her 100th parkrun but also her 100th Tooting Common parkrun. She also marked the occasion with her first PB in a year and a half and went under 27 minutes for the first time, crossing the line in 26:36. 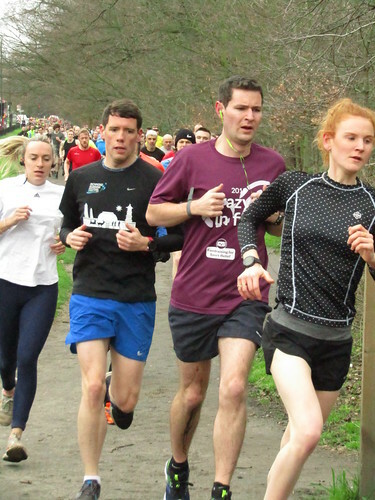 In addition, Bruce Moxham and Lauren Haslam ran their 50th parkruns, with the latter also recording a new PB of 25:36. Finally, Olivia Burman also ran her 10th 5k parkrun as a junior. 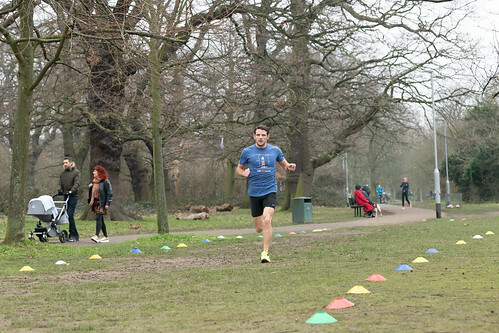 Joe ELLIOTT (SM20-24) of Clapham Chasers RC was first over the line in 17:33. James STOCKER (SM20-24) was second over the line in a new PB of 18:03. An unknown runner was third over the line. Felicity HANNON (SW30-34) of Clapham Chasers RC was first over the line in 19:46. 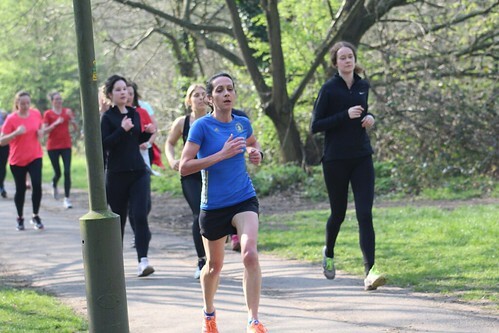 Harriet HART (SW30-34) was second over the line in 20:04 in her first appearance at Tooting Common parkrun. 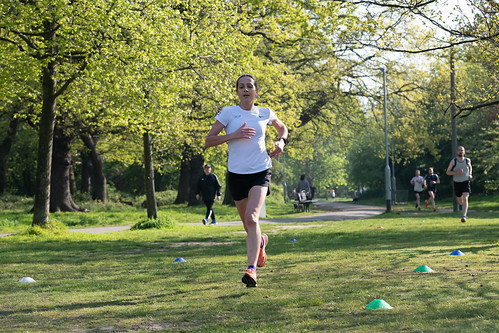 Aimee HARGREAVES (SW20-24) of Stoke AC was third over the line in 20:19 in her first appearance at Tooting Common parkrun. An absolutely stunning March morn on Saturday saw a fantastic turnout of 703 runners and walkers. I don’t think it would be Obtuse of me to say that those of you who failed to hit the ‘Tooting Triangle’ this week are no doubt now showing the first sines of suffering from Acute disappointment. 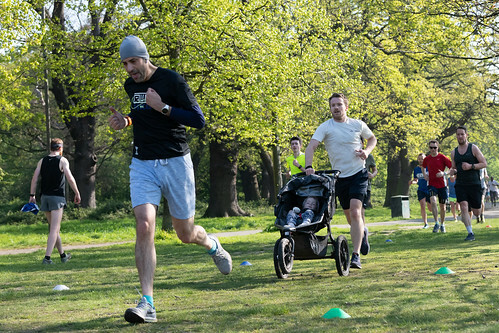 We had 99 Tooting first timers this weekend, 48 of you were brand new to parkrun, the colours of 36 different running clubs were on show, and a massive 127 (18%) of you were Scalene new PB heights, including me Anyway, enough of terrible triangle puns – I’ll stop protracting and just get straight to the point before I go even more off tangent. Congratulations to Stuart (35:24) who completed his 50th parkrun! 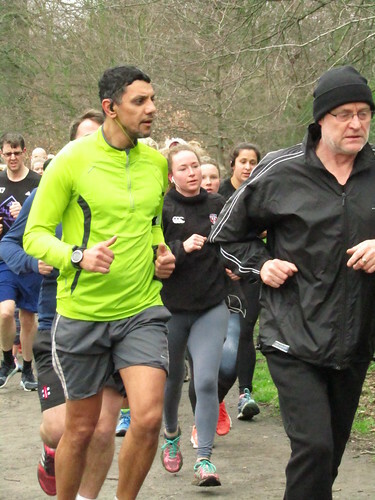 You can often see Hamilton speeding down the Tooting parkrun track during his regular marshalling duties, so it is great to see him reach this special milestone. - The performance of Andy was handy as PUSEY (20:56) broke 21 minutes for the first time in his 64th run at Tooting. - KAZANTZIS can now throw his old PB down the John as he finally dipped under the magical 20 minute mark (19:49), 8 years and 273 runs after he first printed his barcode! - I’m often asked how one can get stronger and faster at parkrun, and my answer is always the same – don’t forget to eat your BREADMAN! Full of carbs for energy. I’m delighted that Jessica (30:43) followed my advice and was rewarded with a fine new PB. - Another source of improvement is to mix up your training and to think outside the BOX. Karina did just that and earned a new best (24:09). - One final way to get your times down is to cheat and do a parkrun in some form of motorised transport. However, despite initial suspicions on account of her rapid improvement, I can confirm that Laura did complete the course CARLESS and earned a great time of 26:09. On a personal note, I would also like to bid a fond farewell to Clapham Chaser Alison (23:43). Despite being not long out of nappies, she has proved an inspiration to many at the club on account of her wonderful Ultra running exploits, including a recent one in Borneo where she was “almost killed” by a Krait snake. She informs me that “it was touch and go for a while”, although it’s possible that she may have been exaggerating slightly. Sadly, she is heading back up to Scotland and so will be deprived of the kind of lovely weather we had this past weekend – let’s just hope she handles the Caldwell. - DFYB! A timely reminder, as our first finisher was an unknown runner. - It is now obvious to everyone that Delaney has a Carload of running talent, as evidenced by his rapid time of 16:49. - Before the run Matt was playing down his chances, declaring “I’ve not been feeling well, and still have a really nasty Kaufman”. Utter nonsense! A superb 17:36 clocking. An unknown runner was 1st over the line. - A cracking 17:38 clocking by Lucie. I’m sure she’ll be back at Tooting again, and that this will therefore not be Custance’s Last Stand. - The labours of Corbin earned due reward as Helena romped across the line in 18:44. - A great run by Foster. Jordan was not Petrafied to go out hard, and was rewarded with a 3rd place finish. Amman to that. Tooting looks as if it’s going to be a fast PB style course where a long legged fit runner can scamper round in under 16 minutes. So I was looking forward to talking about a flat, fast and furious run. How wrong I was proved to be. Visiting with a touring volunteer from Queen Elizabeth parkrun (not flat), we began our day getting lost – and then had a GPS fail when google maps went into melt down. For those of you similarly cartographically confused, head to the café when you finally ask someone where the parkrun is and if you are near the avenue of trees that are newly planted, you are quite close. First timer briefing attended – tick. All barcodes on person, under 11s tethered closely and dogs on short leads: time to get started. And we got started by being corralled into approximate time bands. I wandered towards the rear of the pack and got started, fully intending a nice 30 to 28 minute-er in the spring sunshine. who finished her first ever 5k. Thank you very much all three of you for a happy, head clearing joyful event. 47 of you did it for the first time and remembered your barcode. A number of you came and didn’t scan – 113 – which is rather higher than nationally. Over 1/6 th of a parkrun of 669 participants. Paper, or tag, just join in. However, well done 47 first ever parkrunners. 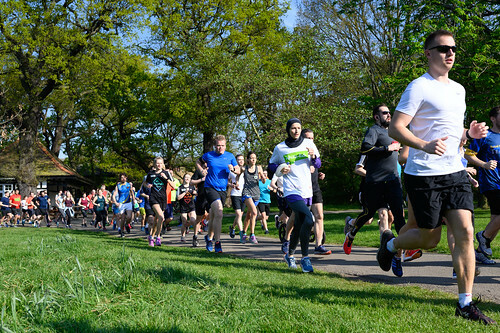 101 of you (with barcodes) were running Tooting for the first time – well done and do come back. Victoria SPOONER joined the 50 club, Joanne DAWES and Selina WRAY the 100 club. Awesome work, and may your t-shirt links go live shortly. I had a different to planned parkrun and it was brilliant. 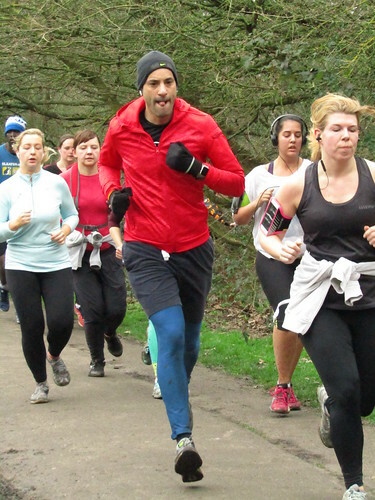 When is a parkrun not a run in a park? 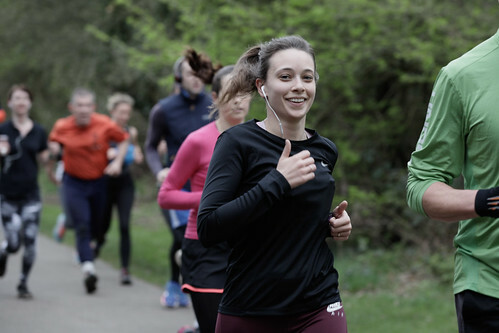 The growth of parkrun has been phenomenal over the past few years, with about 1450 of them now taking place every week in 20 countries across the world. And from the name you would be forgiven for thinking that they all happen on land used for recreation, but this is often not the case. 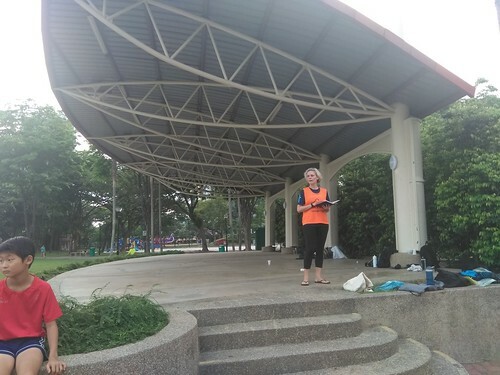 Over time, ‘parkrun’ has become an umbrella term for a series of volunteer-led 5k events taking place on Saturday morning. parkruns are often along the coast, either on a seaside path (such as Hove Promenade parkrun or Worthing parkrun in Sussex) or entirely on sand (such as Inch Beach parkrun and Portrush parkrun on the island of Ireland). 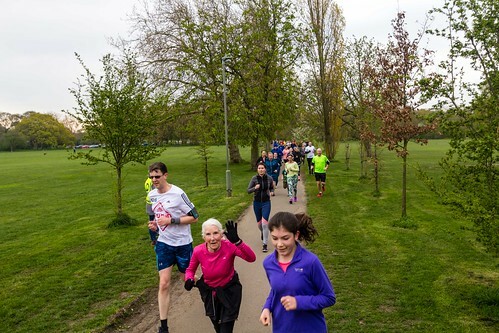 There are parkruns with routes around an island (such as Hamilton Island parkrun in the Whitsundays in Australia and Elagin Ostrov parkrun in St Petersburg in Russia), and one of the latest additions to the London set, Victoria Dock parkrun, is run entirely on dockside paths. In addition, in November 2017 Black Combe parkrun became the first ever weekly 5k event within the grounds of a prison. On my travels this month, I have been to two other parkruns that are also not a run in a park. One is around a bay in a European capital, and the other is along the walls of an Italian city. 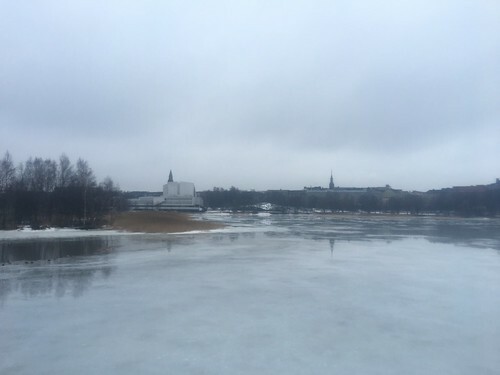 parkrun was first established in Finland in October of 2017 in the city of Tampere. 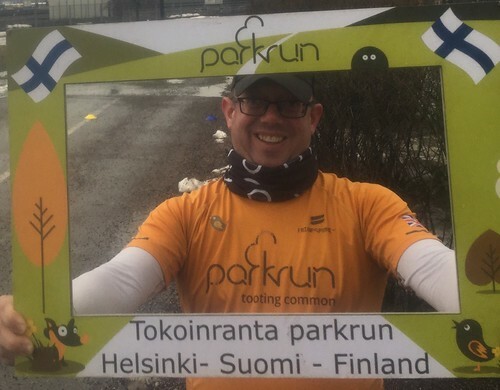 Just under a year later, in late September 2018, the national capital Helsinki welcomed the country’s second parkrun. At around 20 minutes on foot from the main railway station, Tokoinranta parkrun is very easy to get to from the city centre. The course is an out and back, and the majority of the route is along the tarmac paths going around Töölönlahti Bay, a spot which is very popular with the local residents. Going round you are treated to views of Finlandia Hall, a striking marble-coloured congress and event venue designed by the famous Finnish architect Alvar Aalto, and the Finnish National Opera Hall. The turnaround point comes just after you have passed the latter building. The route round the bay and the start/finish stretch are both pancake flat. However, to get between the two you have to go up and over a railway bridge, and the climb up to the bridge is short and steep. It provides a real sting in the tail towards the end! 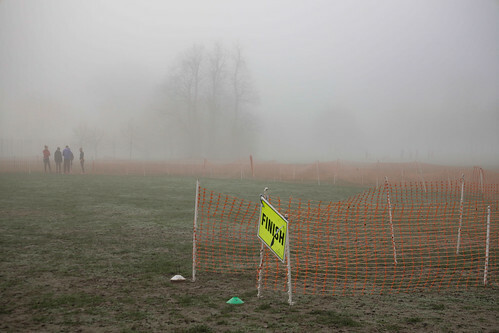 It is also worth noting that during the winter the location of the start/finish area can change. 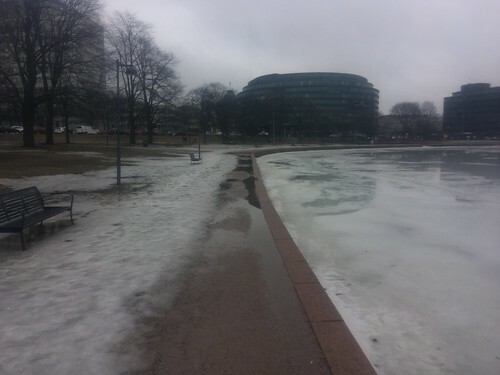 While the route around Töölönlahti Bay is usually free of ice, the path around the edge of Eläintarhanlahti Bay will often freeze over. This was the case when I visited, so the start/finish point moved to Kaisaniemenranta, on the other side of the bay. Finding the start is quite straightforward, though. The parkrun teardrop flag and event selfie frame are always placed out early, and if you can find them then you’ll know you’re in the right area! 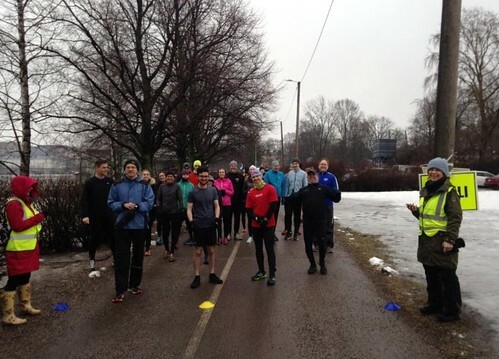 Tokoinranta parkrun is still quite a young event, and on my visit they attracted 28 participants – quite impressive given the cold and the grey skies. However, I can see it getting very popular during the summer and would heartily recommend giving it a go if you’re heading to Finland on holiday. Just be ready for the sting in the tail! The weekend before my visit to Helsinki I headed to the other side of Europe and ran at Lucca in Italy. parkrun began in Italy in May 2015 with the launch of Uditore parkrun in Palermo and now boasts 16 events. Lucca is a town in Tuscany which is roughly hallway between Pisa and Florence. 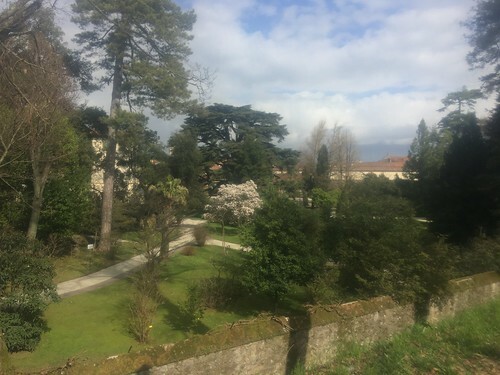 Lucca is renowned for its intact Renaissance-era city walls, which after they lost their military importance became a tree-lined pedestrian promenade. The route around the walls is 4.2 kilometres, and on 25 August 2018 it became the course for Mura di Lucca parkrun. 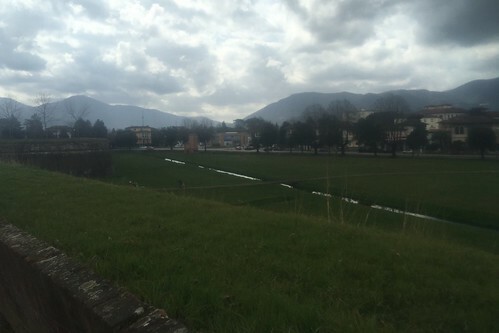 The start of the parkrun is on the southern side of the walls, near the Porta San Pietro. Getting up onto the walls couldn’t be easier; all you have to do is walk up a very gentle and wide tarmac slope. You’ll know you’re in the right place if you can see the Antico Caffe delle Mura building in front of you. If you get there for around 8:40 you can also take part in the legendary Mura di Lucca parkrun warm-up. It lasts for about 10 minutes, and they really put you through your paces with a wide range of exercises and dynamic stretches that will get your heart pumping! After the warm up, everyone heads a little way down the path for the start. The briefing is done in both Italian and English, and visitors are made to feel very welcome. 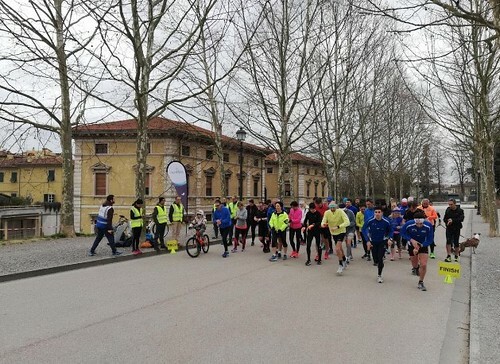 The route of Mura di Lucca parkrun is one anticlockwise lap of the walls, and to make up the extra 0.8 kilometres you begin by running in a clockwise direction towards a statue on the walls. You then go round the statue, return to where you started and begin the lap. 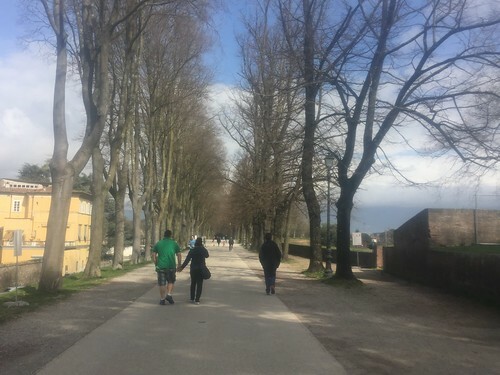 Out of the 134 different parkruns I have been to, Mura di Lucca is definitely one of the most inspiring courses I have run; there is always something of interest to look at as you go round. To your left you can see everything you would expect to see in a Tuscan city – parks, gardens, churches, squares and the odd tower or two thrown in for good measure. And to your right you have beautiful views of the Tuscan countryside and the Apennine mountains in the distance. It really is as glorious a run as it sounds. The course is pancake flat, and as it is almost all tarmac road shoes will be fine all year round here. The weather on the day when I visited was slightly overcast, which made for great running conditions. This, coupled with the inspiring views around the course, led to me running my best time this year. The slight nip in the air meant that there was a lower than usual attendance of 48 when I visited. 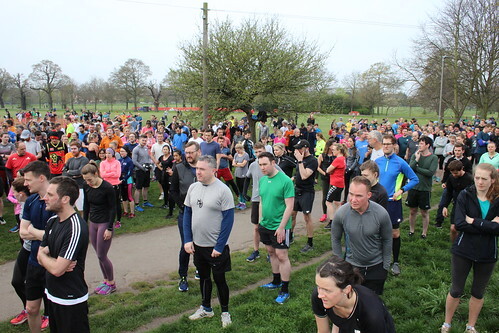 However, this will be a very popular parkrun in the summer, and I can definitely see them breaking the attendance record of 124 (which was set at the inaugural) very soon. 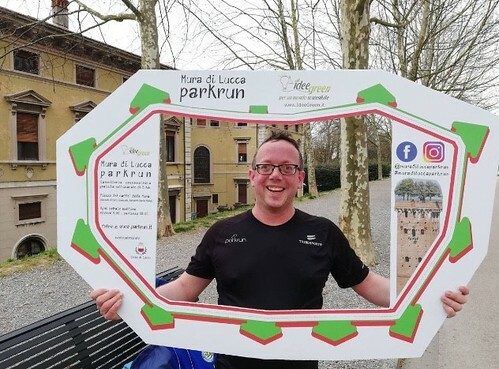 Mura di Lucca parkrun is definitely worth a go if you are in the area on holiday, though there are parkruns in nearby Terme and Florence which I'm sure are equally good. And as at Tokoinranta, the event selfie frame is well worth using too! I'd also heartily recommend exploring the maze of streets within the city walls after your run. See if you can find the tower with trees growing at the top! Also, if like me you are keen on running at parkruns in other countries then you might be interested to know that there is a new parkrun World Tourists group on Facebook. To become a member you need to have run at one parkrun in at least four of the (currently) 20 different countries that have parkruns. To join all you need to is click here and when prompted answer the question asking you which countries you have visited. 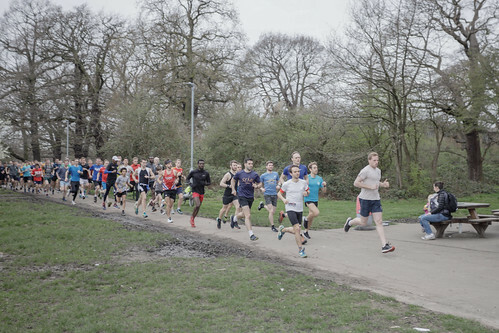 This week 636 people ran, jogged and walked the course, of whom 79 were first timers to Tooting and 31 were running their first ever parkrun. 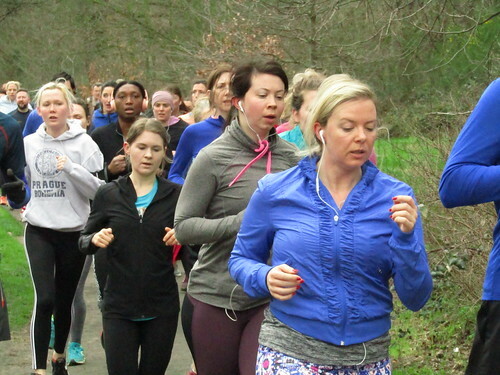 61 recorded new Personal Bests, and representatives of 37 different clubs took part. Nick Bester (SM25-29) of Herne Hill Harriers was first over the line in 17:18. Timothy Wood (SM25-29) of Team Dillon was second over the line in 17:39. Joshua Pewter (SM25-29) of Herne Hill Harriers was third over the line in 17:54. 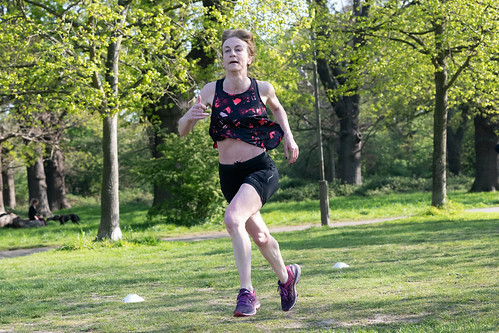 Annie Byrne (SW25-29) was first over the line in 19:31 in her first appearance at Tooting Common parkrun. Jordana Williamson (VW35-39) of Herne Hill Harriers was second over the line in a new PB of 21:44. Helen Oldfield (VW50-54) of Herne Hill Harriers was third over the line in 21:52. Congratulations to Stephanie Hellings, who ran her 50th parkrun with us today. - Our junior stars this week were Herbie Clark, Gethin Parry, Sid Steedman, Jacob Dilley, Maria Carla Rodriguez Kanoti, Stelina Hossain, and Madeleine McGuigan, who all achieved new bests today. - Charlotte Lord continued her impressive recent form, crossing the line in 26:49 which is an improvement of 5 seconds on the time she set last month. - Rizwan Hafiz recorded a new PB for the first time since last November, improving his time by 26 seconds to finish in 25:11. 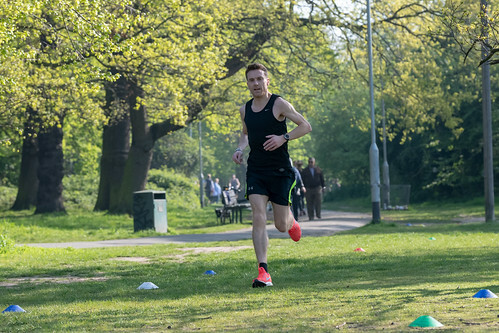 - Julian Abbott, today’s most experienced parkrunner with 387 runs under his belt, returned to run with us for the first time since October 2016 and bettered the time he set then by a very impressive 4 minutes and 10 seconds to cross the line in 23:50. Welcome back, Julian! 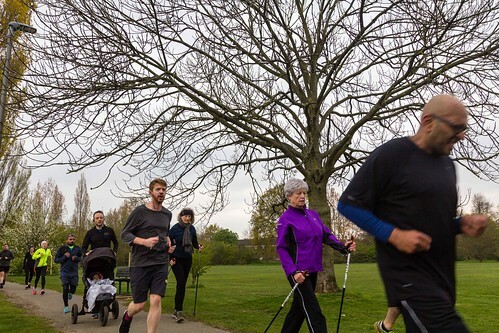 Local Nordic Walking Group Tooting Polers recently decided to push the envelope so to speak and have a go at parkrun. 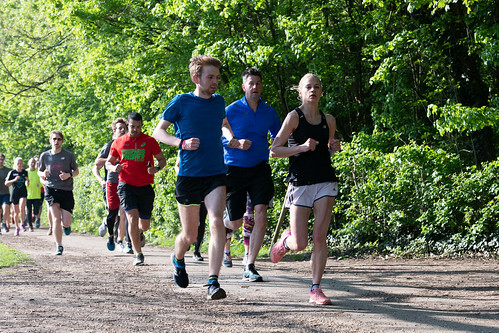 We are already based on Tooting Bec Common and have a regular morning walk once a week so it made sense to up our game and join all those keen runners on a Saturday. Naturally we were expecting to come in towards the back of the field as we are essentially walkers not runners and we didn’t disappoint! Five of us initially did the walk on January 11th and this Saturday’s walk was the 6th I have done personally. 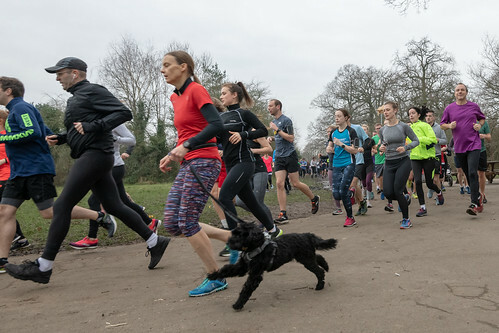 As always there was a huge turnout, and what we have come to appreciate is the variety of people taking part – serious runners, casual runners, runners with prams, with dogs, oldies, children and us walkers with sticks. As a group we have been made to feel very welcome, and the encouragement of all the volunteers dotted along the course has been crucial in getting us to the finish. This week there were 636 taking part of whom 82 were first timers and 35 were doing their first ever parkrun. 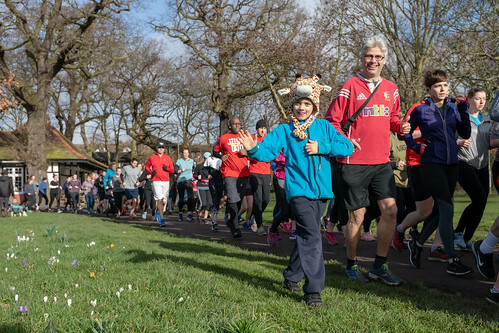 There were 83 PBs (including 5 from junior participants Meg Batty, Olivia Burman, Henry Doherty, Redmond Gurney and Bailey Turner), an impressive number making their 50th or even 100th run and an outstanding trio making this their 250th parkrun!! The weather was typical for an early spring morning – bright and sunny but with a chill in the air. Although dark clouds threatened towards the end of the run it stayed dry - perfect weather for a bit of outdoor exercise. 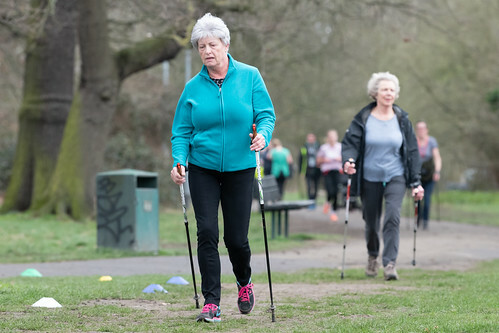 Nordic Walking is increasing in popularity in the UK as the benefits are recognised. It is different from trekking or hill walking as the poles are planted in a specific way that increases the use of the upper body. The poles also help to propel the walker along which means a more concerted effort. 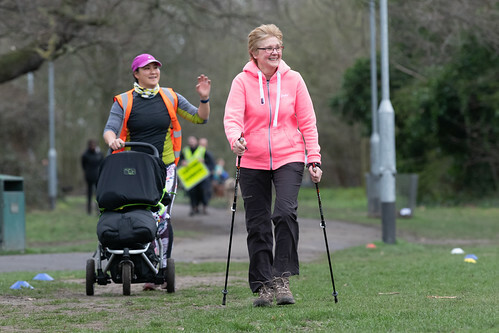 Physically, Nordic walkers will use 90% of the skeletal muscles, burn up to 46% more calories than ordinary walking and reduce the pressure on knees and joints. The technique needs to be taught by a qualified teacher but once you’ve passed the course it can be a free and easy way to keep fit. Our local group is part of an NHS initiative to help keep those at risk of bone problems fit and on the move. Bone density decreases as we age and our group has its share of replacement knees, hips and those at risk of osteoporosis. We walk every Wednesday morning from 9.30-10.30 meeting at the car park on Dr Johnson Avenue and we always have at least one trained leader to make sure our technique is up to scratch. To make it a more social event we reward ourselves with a post walk coffee on the second Wednesday of the month. So, if you’re local, know how to Nordic walk and want to join us we would be delighted to see you. And if you want to come on the parkrun with us that would be marvellous. Spring is my favourite season and one of the highlights of the season is Pancake Day (I flipping love it). 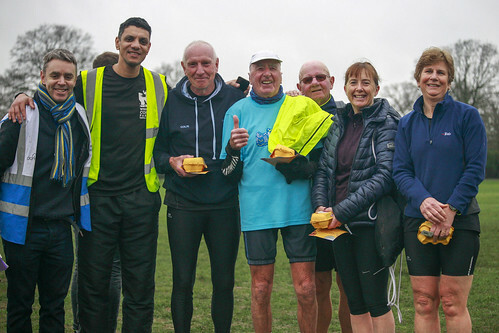 In recognition of Shrove Tuesday falling on 5th March, parkrun partner the Happy Egg Company laid on some treats at Tooting Common which were well received. On a dry (but not frying) morning with the sunny side up, eggs-actly 617 scrambled their way round the Tooting Triangle. 25 hatched their fledgling parkrun career by making their debut today while a further 48 had their first eggs-perience of Tooting Common. Of the r-egg-ular runners Emil Harkness, Jenny Clements, Miles Holway and George Dunn all ran their 50th while Martha Steedman ran her 10th as a junior. In fitting with the event and answering the question who came first (chicken or egg?) 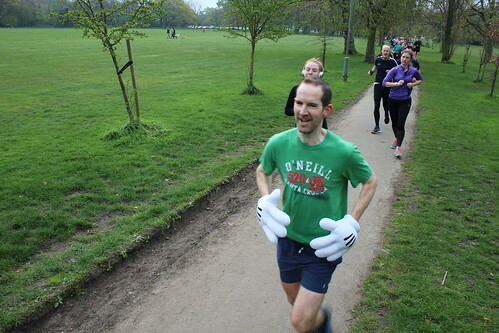 it was someone with an avian name: Dave Finch of Victoria Park Harriers in an eggs-tremely quick 17 minutes 20 seconds. The second and third (albu)men also continued the bird theme: a brace of (Ealing) Eagles in the form of Thomas Glasock in 17:38 and Matt Kaufman in 17:50. Lois Bond of Windsor, Slough, Eton & Hounslow AC was the fastest female in 19:23 followed by Tara Phillips in 20:54 and Stacy Wheat of Herne Hill Harriers in 21:17. Dave and Tara were two of those making their maiden appearance at Tooting this week but they may be hatching plans to be TC bound again to maintain their eggs-emplary record so far on this run. Elsewhere in the field, an eggs-traordinary 117 set new PBs: a cracking effort that I hope all shell be pleased with their eggs-ertions. Of course parkrun cannot take place without those going the eggs-tra mile by volunteering their time and feathers in caps should go to this week’s team of Emily BARR, Isobel BEINT, Cecilia BOGLE, Richard BOGLE, Christina BURMAN, Howard COAN, Sophie COLE, Emily COOPER, Catherine DA GRACA, Tamara DAVIES, Jaspal DHALLEY, Kathryn EVANS, Simon GALLACHER, Alex GEACH, Holly HAMILTON, Oliver HARTLEY, Sai-Yee LAM, Catherine LAW, Iona MARNEY, Saba NAYAB, Sarah O'CARROLL, Liam O'HARE, Helen OLDFIELD, Mavis ORBAN, Grace PLASTOW, Andy PUSEY, Ruth SLATER, Imogen SWALES, Tina For Gary TUNSTALL, Brigid WALTERS, Andrew WARDEN, David WHITE, Ken WILLIS, Marie-Anne WONG, Charlene WONG MIN and Rob WOODWARD. The final mention must go to John Butcher, a spring chicken at 87 years young. 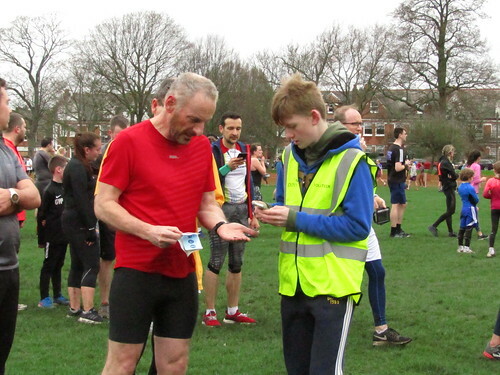 John made the trip from Ware in Hertfordshire to Tooting Common for the first time and has clocked up nearly 250 parkruns in total. 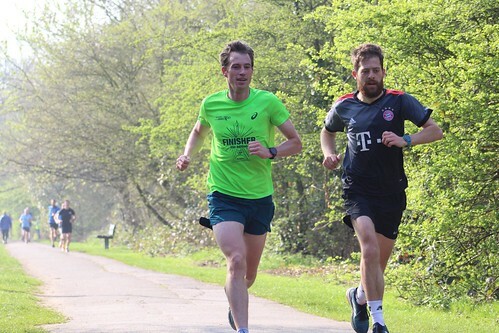 While his time this week of 32:33 is noteworthy in itself, he has run at almost 100 different parkruns and has poached the age record at most of them. Eggs-cellent stuff. Not one to take things over-easy, he has also volunteered over 50 times: an inspiring eggs-ample for us all. There’s an old film called ‘Brigadoon’, where a couple of tourists stumble over a misty magical village in the Scottish highlands that only appears once every 100 years. 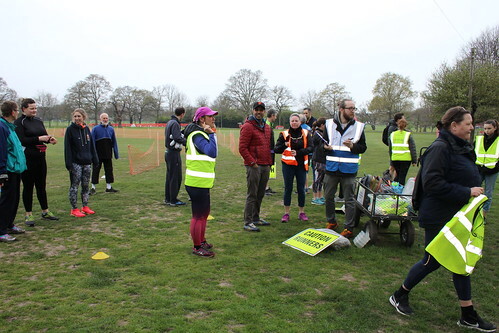 As I head towards the set-up area each Saturday, I often feel that parkrun is a little like this: from the teeniest four-wheeled trolley, a whole run magically appears (and is tidily packed away again). In 100 minutes it is all done and dusted and the Common returns to the usual day-to-day collection of walkers, dogs, bikes and so on, and the apparition of hundreds of variably ‘glowing’ lycra-clad stars...well, did that all really happen? Where has it all gone to? This Saturday was no different. 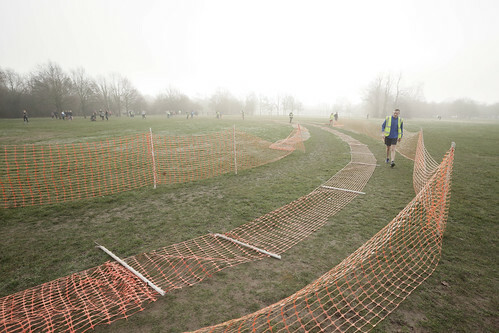 From around 08:15, the happy band of volunteers are wrestling with funnel barriers, placing the cones to guide you home, handing out barcodes and briefing marshals to make sure you get a good balance of encouragement (‘you really are doing something fantastic runners’), cajoling (‘keep left, make space for other park users, no, really keep left, that's your left...’) and top tips to help you manage the course safely. This week, we began in eerie mist and ended in something approximating sunshine. 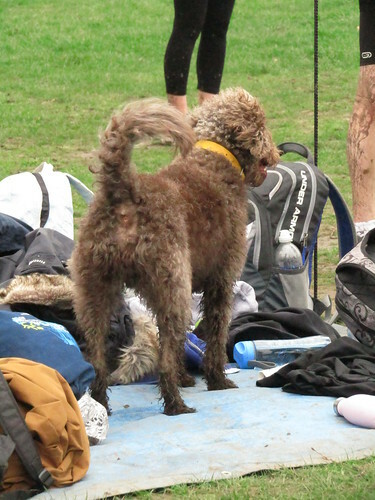 691 pacey people participated, negotiating all the tricky little corners and muddy pathways with ease and delight. Well, mostly. 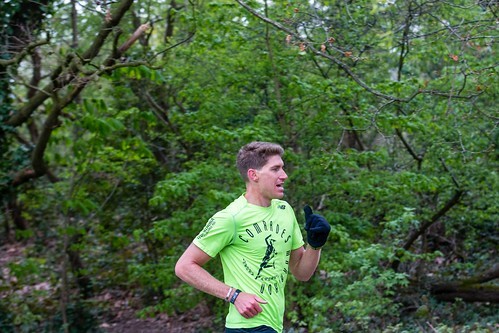 The first male to startle the crew at the finishing line was Joe Elliott (Clapham Chasers RC - SM20-24) in 17:07, separated by a blade of grass from Juan David Casasbuenas (SM30-34) in 17:08. Matt Sharma, a first-timer, was chasing hard in third place with a time of 17:40 (SM30-34). The first female to tear across the finish line was Ghiselle Green (SW25-29) in 19:45 - a new PB! Second up was Sophie Johnson (Guildford & Godalming AC - SW20-24) in 20:53 and Helen Oldfield (Herne Hill Harriers - VW50-54) swept in at 21:44. A quintet of quick runners reached their ‘50 events’ milestone today - Phil Beckett, Derek Breslin, Brendan Foley, Steve Parker and Liz A Smith, with Derek marking the occasion with a new PB. Well done all! It was really encouraging to see so many junior runners out there today - 23 all told, with Dylan Sweet (JM15-17) clocking in at under 20 minutes (18:59) - a new PB. Olivia Jerman was the first junior female home, with a super sub-30 effort (28:35). 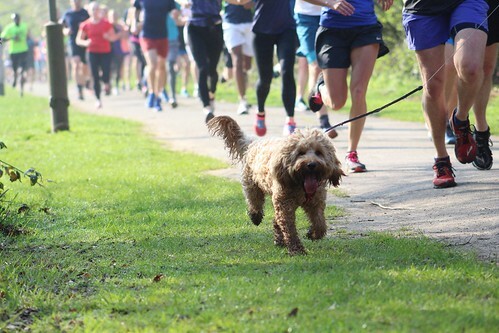 See you all again next week (and the next…) when for those magical 100 minutes, parkrun comes to life on the Common. I’ll be there at Track Corner yelling like mad and always, always, coming away feeling that it’s a real privilege to support you all. I’ve barely got through the leftover mince pies and it seems it’s spring already! 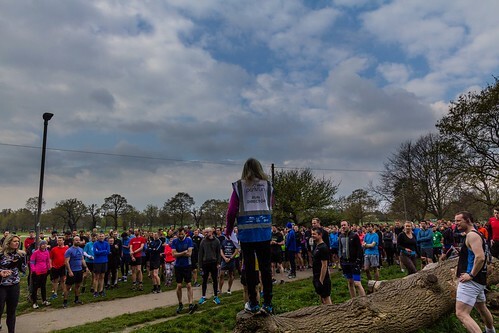 You’ve be forgiven for thinking that the laws of time no longer apply if you were here at the first ever Tooting Common parkrun back in January of 2016 – in what seems like moments here we are three years on and 156 events in. 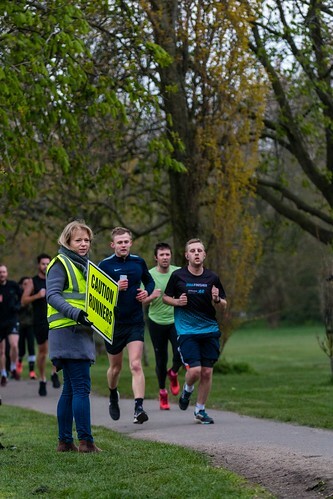 Our weekly participation is growing ever stronger; this week we saw 655 finishers across the line with 39 tireless volunteers on hand to help them reach their goal, whether that be finishing faster, finishing first or finishing full stop. Speaking of fast and first, Jon Harrison of Chorlton Runners broke the metaphorical tape in 17:12 with junior runner Tobias Allen of Newbury an incredible 25 seconds behind him in third. Tobias led home the 18 under-18s, a fantastic turnout for our potential future Olympians (no pressure). 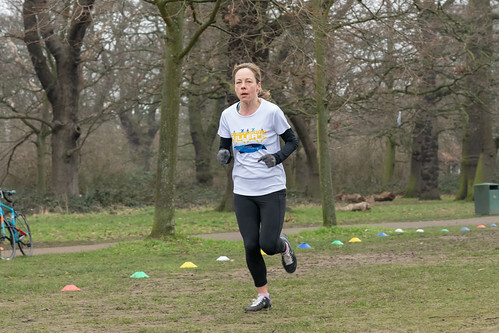 Meanwhile his clubmate Rachel Allen was third among the ladies in 20:29, chasing down Sinead Egan who finished 15 seconds ahead, and first lady Rachel Badham of West 4 Harriers, who ran a speedy 19:49 on her first outing at Tooting. Rachel B and Sinead were all among the 132 parkrunners who recorded personal bests today; that’s 20% of the field! A huge shout out also goes to the 7 junior stars who joined Team PB: Curtis Hines, Hugo Scott, Jarvis Hines, Alex Guest, Poppy Rolfe, Eva Hagen and Stella Rodriguez Kanoti. Richard Rosenberg put his speedy feet to good use today; after storming home in a personal best time of 23:03 he left himself plenty of time to help ensure the funnel stayed in sync and clock a PB and volunteering double. (For those of you who ever thought you’d like to help out but you don’t want to miss a run… ) Special PB mentions go to Richard Stansfield and his first sub-21, Deborah Tarrant who sliced 53 seconds off her time from last month, and regulars Hannah Quick and Jennifer Slater – great work everyone! 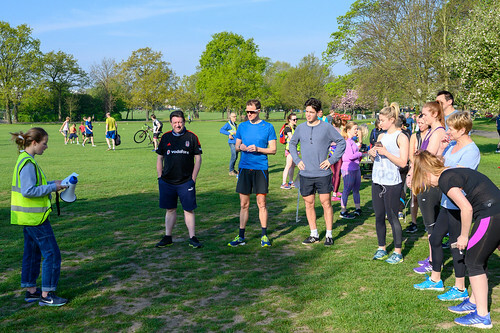 Despite going for three years we are still regularly welcoming new parkrunners to the fold here, with 41 people – more than 6% of the field – registering their first ever parkrun. 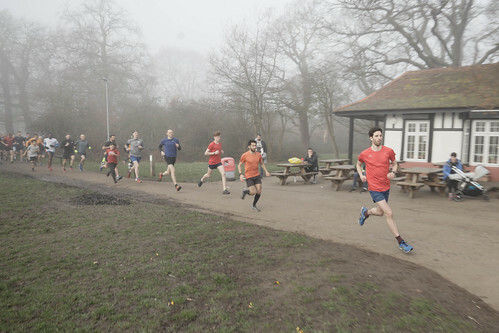 To see so many newcomers braving the Trioundabout every week is so inspiring, and reminds me to take advantage of the opportunity that parkrun offers as much as I can. On the other end of the scale Kathryn Evans of Roadhoggs Leicester finished her 232nd parkrun to become our most experienced finisher of the day - only 18 away from the 250 shirt! 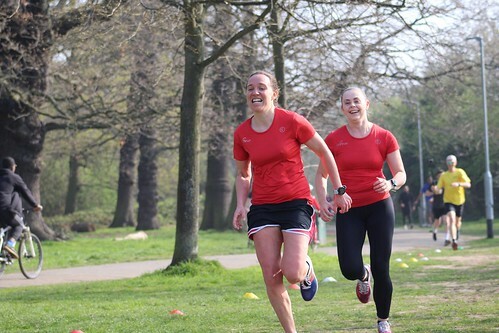 Speaking of milestones, congratulations go to Dan Abbott and Alice Williams who finished their 50th parkruns today and can look forward to picking up their red shirts. We’ll be keeping an eye on Phil Beckett, Derek Breslin, Steve Parker, Beth Francis and Liz A Smith next week, all on run number 49! Now, my treat to myself… of the 655 finishers Harvey von Biel was our median position runner, finishing exactly halfway through the field in 26:48, while first time parkrunner Peter Ward came in closest to our median time in 556th place. 356 runners or 54% of the field finished inside the course’s current average finish time of 27:13. I’m not sure who reads this paragraph but I like to keep track of how Tooting parkrun continues to grow and grow. 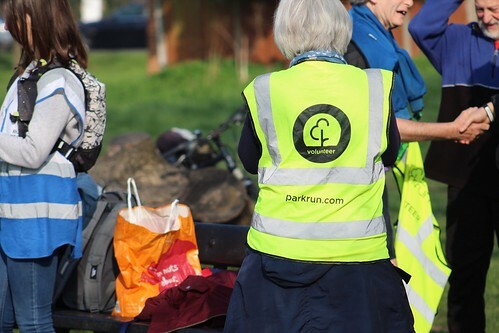 The final word, as always, goes to the people who helped out today, and as parkrun can’t go ahead without the support of its volunteers I’d like to say a huge thank you to them all. 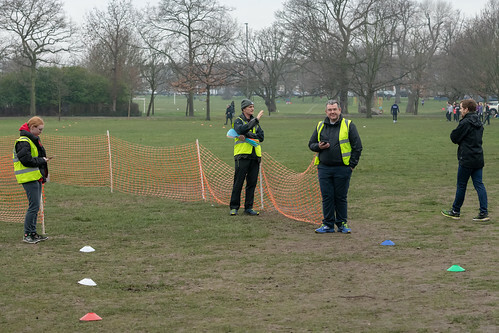 If you’d like to get involved please contact tootingcommon@parkrun.com or speak to one of the marshals at the next event, and if not that’s fine – just remember always thank your marshals on the way round and spread a little joy!